Luigi Kalaj & Associates sold our home first week on the market and they sold it for the price we were asking. Luigi and his sisters were very professional and always available to answer our questions throughout the entire process. Definitely we will reefer Luigi, Lucia and Anna to all our friends and family! We had a great experience working with Luigi Kalaj & Associates. luigi's team listed our home and were buyer's agents for our new home. Their experience,knowledge,calm under pressure,professionalism,and charm are greatly appreciated! Their family could not be more wonderful or expert. We are so grateful for their help. Luigi Kalaj and Associates, the absolute best Realtors!You simply must give them a try, I promise you will never use anyone else again. they came out on a very short notice and were amazingly helpful and very engaged, they gave me great advice on preparing my home for sale and as a result I had 3 offers, all were at my asking price. You can trust the expert team, they work well together to overcome any issues inspections, appraisal or anything pertaining with selling a home to make sure we went to closing. I would recommend Luigi, Lucia and Anna to all my family and friends because they are great Realtors! We were looking to buy a home for a long time but we were not able to find that one home that would fit our needs. We saw many homes with different Realtors but they didn't listen to what we wanted, then we met Luigi at one of his open houses and he listened to what we were looking for. In less then four weeks Luigi and his Associates found us the right home. They not only negotiated a great price for us but guided us with inspections and lenders. Thanks to Luigi, Lucia and Anna we are now in our beautiful new home that we love. Luigi was our third listing agent. The previous two Realtors we had prior were extremely disappointing. Luigi and his Associates however were very active in showing the house the first week it was listed. They personally went through the house and made a list of small enhancements to increase saleability and also aided us in finding reliable trade people to help us as needed. 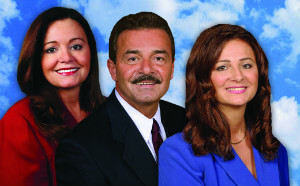 In our opinion, Luigi, Lucia and Anna are exceptional Real Estate agents who puts their heart and soul into their jobs. Luigi and his Team have gone above and beyond what real estate agents do. We have bought and sold homes in the past, but these Realtors are different from other Realtors, they know what it takes to sell your home. When they says they will do whatever it takes to sell your home, they mean it. We sold our home in just four and a half weeks. We were lucky to have had Luigi, Lucia and Anna to represent us. They got us a great price for our home. We would recommend them to our family and friends. We interviewed with two other agents before choosing Luigi, Lucia and Anna. It did not take long to decide that this was the right Team of Realtors to sell our home. Luigi and Associates know the market area; they know how and where to market to get their listings sold. They gave us recommendations on improving the appearance of our home, the other Realtors did not. They were honest and straight forward. They kept in contact with us constantly and they sold our home in a down market. Luigi and his Associates were there for us and have consistently exceeded our expectations.